But such times are rare, for the age of kings and queens has not yet passed, and many are the years when oppression weighs heavy on the backs of common folk. 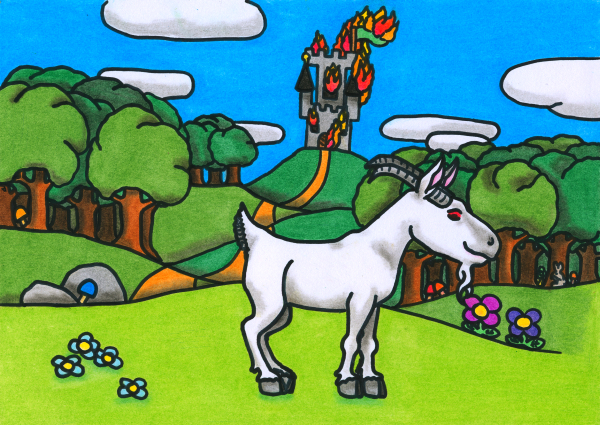 And then come the days when Herbert is feared, for he is Herbert the Mutant Radical Goat, whose spirit long ago possessed the creators of theatre, whose dances were danced around the fire when humankind was young. He is the force that persists, that laughs in the face of history. He is ancient and untameable, and sooner of later he will break down the castle doors; for he is Energy, and Energy cannot be stopped. Even when it does look a little silly. Even now, Herbert is out there, moving among us, moving within us, and the kings and the queens tremble at his approach, and the poets mumble in their sleep and an ache in their souls reminds them of where their true allegiance lies. As for his mutation… well, let’s just say he was quite popular in Ancient Greece. This entry in the Oneiropolis Compendium was made possible by Bachi, the author of 36 Metric Weeks, who lives inside a thousand fat horses.